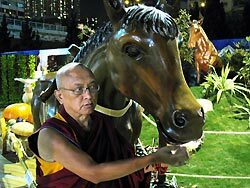 Lama Zopa Rinpoche in Hong Kong, March 2008. 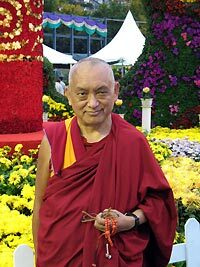 Rinpoche’s visits to Brazil and Colombia have been postponed until 2009. “I think she was being polite. So I told her you should always remember that retreat means making war on delusions. You have to always remember this: this is inner war, but this is a one-time war. Once you defeat delusion by ceasing the cause, the seed of delusion, by actualizing the remedy, which is the path, it doesn’t come back again. Once the seed is removed the delusion never comes back, so this is just a one-time war. Outside external wars are endless, because you have to fight again and again. “What happened to your grandfather is a great teaching for us, it shows the reality of life, it is telling us what we need to do with our life. There is nothing more beneficial than holy Dharma. 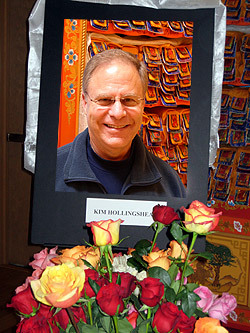 Kim, Administration Director at International Office, died of a heart attack on Tuesday afternoon just outside the International Office building in Portland, Oregon, USA. He had a known heart problem, and it seems he died immediately. With amazing good karma on Kim’s part, within 40 minutes of Kim being declared dead, Yangsi Rinpoche (director and resident geshe at Maitripa Institute) and other students were doing prayers as advised by Lama Zopa Rinpoche by Kim’s body, Lama Zopa Rinpoche and Choden Rinpoche were doing prayers for Kim in California, and Geshe Ngawang Dragpa (resident geshe at Tse Chen Ling) was making prayers and checking the best timing astrologically for the practical aspects of Kim’s death. International Office staff and many students at Maitripa Institute participated in Lama Chopa (Guru Puja) dedicated to Kim’s perfect rebirth, led by Yangsi Rinpoche. Many, many thanks and heartfelt appreciation to all of you around the world who have included Kim in your prayers – the power and the support of the FPMT family at times like these is truly wonderful. We here at International Office will miss Kim very much, and we know that his friends around the world will miss him too. When I first took on the role as Director I took criticism very much to heart as I wanted to be successful in running the Centre. Now I expect criticism, listen to it but don’t let it worry me. Criticism is very useful; if taken with a positive mind it allows us all to grow. This alone is such a precious gift of Dharma that Rinpoche has enabled me to learn through serving him. Shantideva gave so much excellent advice on this; if I do get a dent or two I take time out with him. For a Centre to grow we have to accept that it is unlikely that any of us are perfect yet have a lot to learn from each other. So if something is not working we need to try and fix it in a manner that allows everyone involved to have that opportunity to grow. This and other helpful advice will be used to update FPMT’s Center Director Helpbook – dear center directors, please keep sending Claire tips and comments which you would like to share with fellow center directors! The June-July issue will be available around May 7, and contains an in-depth look at the Tibet situation from the Dalai Lama, Robert Thurman, Yangsi Rinpoche and advice from Lama Zopa Rinpoche. We have a brand new column from one of our FPMT teachers, Ven. Tenzin Chonyi, entitled ‘Mixed Motives,’ that really gives us food for thought, plus more sangha news from IMI – and some intriguing information from our new publisher! We are very happy to announce that Merry Colony is back from retreat and is continuing to offer service as Education Director! “We of Chenrezig Institute would firstly like to offer to you every moment of merit accumulated during the Mani Retreat held here at Chenrezig Institute this year, in which a dedicated group of Sangha and lay people completed 3,153,000 recitations of Om Mani Padme Hum. In accordance with your holy wishes we dedicate this merit to the long life of His Holiness the Dalai Lama and to you, our precious Guru. May all your holy wishes be instantly fulfilled and may you remain long with us, turning the wheel of dharma for the sake of all migrators while ever cyclic existence remains. 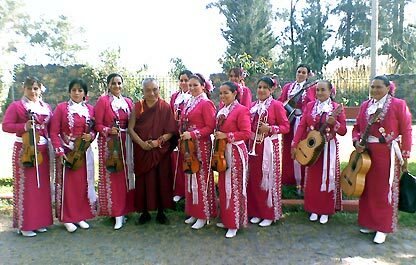 Rinpoche with mariachi band in Mexico, April 2008. Dharma and the Art of Motorcycle, Car, and Travel Maintenance…. Is there a link between mindfulness, travel, and the wellbeing of indigenous communities? The amount of fuel our travel consumes, and the “footprint” of the fuel used, both have a direct and indirect effect on people in faraway parts of the globe. Millions of people are already being affected by food price increases, not only as a result of shortages caused by climate change droughts and floods, but also as a result of subsidies diverting food-crop land to biofuels – which often use more fossil fuel to produce than they embody! Finding ways to reduce our harmful impact on others is a wonderful meditation on mindfulness and compassion. Opportunities include various volunteer positions and work exchange programs, and two USA centers looking for chefs! Fred Lemstra and Maya Toledano would like to offer service (as a couple) to an FPMT center or project. They have been helping at Tushita Meditation Centre, Dharamsala, and are highly recommended by Drolkar, Tushita’s director! Fred is mainly interested in supervising building projects, but is open to all other suggestions. He says “I love working with people and organizing teams and projects”. He has a background in successfully running his own construction company. Lama Zopa Rinpoche would like to feed all beings…! Hong Kong, April 2008. Fred is fluent in English/Dutch/German, basic Hebrew. Maya is fluent in English/Hebrew, basic Dutch. They would prefer a position with a stipend since they can’t cover all expenses on their own. If you have positions which you would like to discuss with Fred and Maya, please contact Claire!